Founded in 1920, Honeywell International (HON) is a diversified industrial giant operating in about 70 countries. The company invents and commercializes technologies that address some of the world’s most critical challenges around energy, safety, security, productivity, and urbanization. Aerospace (38% of revenue, 41% of profits): products are used on virtually every commercial and defense aircraft platform and in 100M+ vehicles worldwide and include aircraft propulsion, cockpit systems, satellite communications, and vehicle turbochargers. About a third of this business is dedicated to providing spare parts, repair, overhaul, and aftermarket maintenance services under long-term contracts. Home and Building Technologies (23% of revenue, 21% of profits): products, software, solutions, and technologies that help homeowners, commercial building owners, and occupants. This segment's offerings include controls and displays for heating, cooling, indoor air quality, ventilation, humidification, and lighting and home automation. Performance Materials and Technologies (24% of revenue, 27% of profits): Honeywell develops advanced materials (additives, fibers, chemicals, etc. ), process technologies, automation solutions, and industrial software for the oil and gas, refining, pulp and paper, industrial power generation, chemicals and petrochemicals, biofuels, life sciences, and metals, minerals and mining industries. Safety and Productivity Solutions (14% of revenue, 11% of profits): Honeywell improves enterprise performance and worker safety and productivity with its scanning and mobile computers, software, warehouse automation solutions, and personal protective equipment. The company's sales are highly diversified geographically with 53% of revenue generated outside the U.S.
Generally speaking, the global industrial sector is characterized by boom and bust cycles and is highly fragmented with numerous large rivals battling for market share. In order to earn a competitive advantage, most industrial companies need to possess several qualities. In Honeywell's case, it first benefits from its long history of offering well-designed and reliable mission-critical components that its customers can depend on. For example, commercial aircraft are some of the most complex machines ever designed, with the average commercial jet including thousands of connected systems and running on hundreds of millions of lines of computer code. This shows the importance of aerospace components being well-integrated into both the physical and digital systems of planes that are expected to carry hundreds of passengers at a time, fly for thousands of miles, and operate for as long as 30 years. Honeywell is an industry leader in aerospace software and plans to have 80% of its 109 aerospace systems digitally connected and integrated with its fast-growing software-as-a-service offerings by 2019, which will further increase the stickiness of its relationships with customers. Honeywell considers aerospace software to be a large and attractive market, one in which it can compete very effectively in. In fact, the company expects 30% to 45% of the company's aerospace organic growth to come from software and connected devices. That's thanks to offerings like the company's GoDirect Flight service software which can cut flight planning time in half. Honeywell's deep experience in the industry is why plane makers like Airbus, Boeing, Embraer, and Gulfstream trust the company so much. In fact, in aerospace Honeywell has won 75% of the contracts it bid on since 2013. Meanwhile, the company's aftermarket (i.e. contracted maintenance) unit saw 6% sales growth in 2017 and management expects the global industry for maintenance & repair contracts to grow by 5% through at least 2022. High-margin aftermarket business creates a far more stable source of sales and cash flow that will reduce the company's earnings volatility in the future. Once a plane is designed with certain Honeywell components inside, manufacturers and end users are loath to switch suppliers because it increases the risks of something going wrong, which can have deadly consequences. In addition to its sticky ecosystem, Honeywell also benefits from leading intellectual property, courtesy of its $1.8 billion annual R&D budget. The company historically spends 5% of revenue on R&D to continually innovate new products. That's why its upstream oil & gas production unit alone boasts 3,000 patents. The company is also well-positioned in its other industries thanks to its very long relationships with global customers. With an operating history dating back nearly a century, Honeywell has built an enormous installed base. For instance, in the Home & Building segment Honeywell has an installed base of 150 million homes and 10 million buildings. Maintaining these properties represents a $100 billion annual addressable market. However, a large installed base isn't enough. Constantly changing technology and industry conditions force companies to change, adapt, and restructure over time to remain relevant. Honeywell has a very good track record here, including selling or spinning off lower margin and slower growing units. For example, Honeywell and GE attempted a merger in 2001 that ultimately failed. After the deal fell through, management decided it would focus on expanding Honeywell's portfolio of industry-leading products instead of attempting large, needle-moving deals. This meant a focus on smaller bolt-on acquisitions ($8 billion in acquisitions since 2015), and jettisoning lower margin businesses. The latest efforts including spinoffs of its Homes (climate and security controls and fire and security distributor) and Transportation systems (automotive turbochargers) businesses, which contributed $4.5 billion and $3.1 billion in 2017 sales, respectively, or about 19% of total revenue. The elimination of these latest businesses is to be completed by the end of 2018 and is expected to lift Honeywell's operating margin from 10% in 2016 to about 18% by the end of 2018. 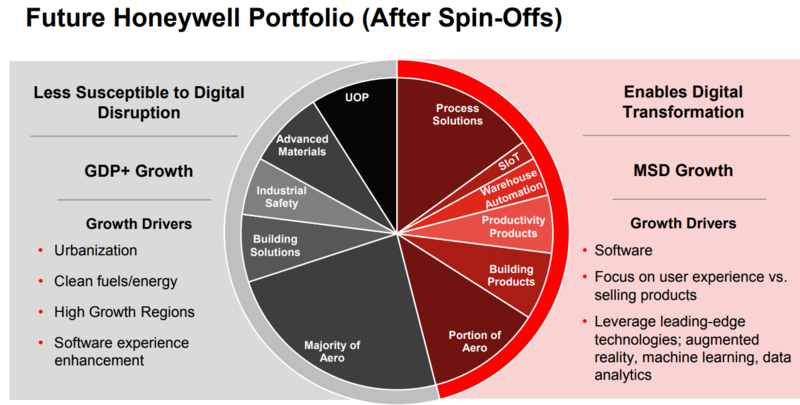 While spinoffs reduce Honeywell's revenue and cash flow, they also eliminate eliminate legacy legal and pension liabilities and let the company focus on its strongest growth opportunities. And thanks to tax reform allowing Honeywell to repatriate $7 billion in foreign cash in 2018 and 2019, the company's dividend will be safe from any temporary decline in cash flow that results from the spinoffs. In addition, management expects to net about $3 billion in cash from the spinoffs, further augmenting its strong capital position and allowing Honeywell to more aggressively focus on its two major growth drivers. The first is software-as-a-service. This is the cornerstone of the Honeywell User Experience and its famous Honeywell Operating System, or HOS. With the latest version of HOS, management explains, "We aspire to be the Apple of the industrial sector with intuitive easy to use, easy to install, and easy to repair products that delight the users." The core of Honeywell's user experiences and operating system is increasingly the company's software. In 2017, Honeywell saw 23% growth in software-as-a-service, totalling about $1.5 billion (almost 4% of total sales). The company expects to achieve about 20% software growth in 2018 which would indicate that software-as-a-service (a highly stable and recurring source of revenue) will become a leading growth driver for the company going forward. This is in addition to connected hardware, part of the booming "Internet of Things", or IoT industry, which is generating over $1 billion in sales for Honeywell and growing quickly. Industrial IoT consists mostly of products linked to the internet that allow advanced monitoring and data analysis to better plan maintenance and improve efficiency. IoT is also a key way that worker safety can be improved. Last year about 2.4 million global workers were killed due to job-related injuries, a solution that the company's safety and productivity segment aims to address. And in terms of productivity, Honeywell is working on technologies (via software and IoT) that can help automate the world's warehouses, which it estimates is a $12+ billion addressable market that's growing quickly. The company's effort was bolstered by its 2016 acquisition of warehouse automation solution company Integrated which Honeywell bought for $1.5 billion. Software-as-a-service and the IoT are such big priorities for Honeywell because they carry high margins and greatly reduce the volatility of sales and earnings due to the long-term, recurring nature of their cash flow. As Honeywell's industrial customers increasingly turn to software and data analytics solutions, the company's earnings stream should become all the more lucrative and resilient. But Honeywell is staying plenty busy in other areas of its business as well, including making the launch of new products a priority. The company plans to release 130 new products in its Performance Materials and Technology segment alone in 2018, for example. This fast pace of new development is why 24% of Honeywell's 2017 sales were from new products (launched within the last few years). It also highlights a relatively nimble company (for the industry and its size) that is able to achieve faster growth through ongoing innovation. Another important growth driver for Honeywell is what it calls high growth regions, meaning China and India, the Middle East and Latin America. Economists expect these regions to make up about 50% of the global economy by 2030. In 2017, Honeywell's sales grew 25% in China and 19% in India, demonstrating that management is executing well on expanding into the most important markets of the future. But while Honeywell's long-term growth potential is significant, it's just as important that management is capable of delivering profitable growth. The company's long-term goal is to increase segment margins from 19% in 2017 to 23% by 2022. Thanks to the upcoming effects of cost cutting and tax reform, the company is well on track to hit those targets. All of Honeywell's long-term financial targets can be seen below. As it relates to the dividend, management expects the company's payout to grow in-line with earnings growth, which will likely be at a high single-digit to low double-digit pace over the long term. Honeywell has a great track record of paying uninterrupted dividends for more than 25 years. Since 2010, and including the 12% increase announced in early 2018, the company has also increased its dividend rate 10% or more eight times. Management expects its improved margins and growing cash flow to translate into about $40 billion in deployable cash between 2018 and 2022. After dividends and buybacks, that will leave the company with about $23 billion in cash to fund its growth ambitions and try to win market share in the growth markets of the future. Overall, Honeywell appears to be one of the best long-term dividend growth stocks in the industrial sector. The business has its hands in many different industries and technologies, and as Honeywell becomes a more software-industrial firm, its earnings stream will be all the more valuable. While Honeywell has done an admirable job of minimizing its sales and earnings volatility over the last few years, it's important to realize that the company's free cash flow will likely remain cyclical. According to Thomas Szlosek, Senior Vice President and Chief Financial Officer, 60% of Honeywell's sales are "short cycle" meaning that sales visibility is weak. During strong economic times, sales and earnings can surprise to the upside. However, during economic or industry downturns, such as the recent global industrial recession, sales, earnings, and cash flow can miss expectations. Investors also need to realize that as a global company, Honeyway faces two short-term risks from its international businesses. First, a potential trade war could hurt the company's exports from the U.S. which comprised 12% of 2017 sales. Additionally, as Honeywell's international sales grow, especially in regions such as China and India, the firm's cash flow growth could become more volatile due to currency fluctuations between the US dollar and the Chinese Renminbi and Indian Rupee. Fortunately, none of these issues should affect Honeywell's long-term earnings power. However, it is important to realize that Honeywell's growth opportunities are also being pursued by plenty of large and well-capitalized rivals in each of its key business segments. Honeywell will have to continue investing heavily into R&D and software development in order to win market share from its large peers, all of which also want a piece of the software-as-a-service and IoT markets. Management may also be increasingly tempted to make a large acquisition to gain a leg up in these areas. Thanks to its long history of producing reliable and innovative industrial products, Honeywell is well-positioned to benefit from some of the most important economic trends of the future. Specifically, Honeywell should benefit from the growing importance of software, data analytics, IoT, and automation in all aspects of industrial production, warehouses, and commercial aircraft. The company's increased focus on higher margin and recurring revenue sources, including aftermarket aerospace, software, and connected devices, also means that its sales, earnings, and cash flow should become more stable (and valuable) in the future. Combined with close to 10% annual dividend growth prospects over the long term, Honeywell represents an attractive industrial business to consider as part of a diversified income growth portfolio.